The Disability Access Plan (Word) and Disability Access Plan (PDF) are available for easy download and printing. Access information is also available on the Geraldton Airport You're Welcome listing. Detailed information on the assistance available for each stage of the journey for passengers with a disability where the disability may include; vision impairment, use of a wheelchair, intellectual or physical disability, hearing impairment and ambulant disability. Passengers with a disability are advised to contact the airline, or agent for the airline, prior to arrival at Geraldton Airport for any assistance that may be required. The airline or agent will then proceed to make the arrangements necessary to assist the passenger both on arrival at the Airport and in boarding the Aircraft, for example provision of wheel chair or lifting equipment. Seating arrangements may be required for a guide person or assistance animal who may be required to travel with the passenger. At the time of booking, it is advisable for passengers to provide the airline with information regarding any special medical needs or equipment, which may be required whilst travelling, for example an oxygen cylinder. The airline will require this information well in advance to ensure that the appropriate arrangements can be made to accommodate the needs of the passenger. A list of airlines which service Geraldton Airport is available on the Links Page on the Geraldton Airport website. A drop off pick-up area is available directly in front of the Departure and Arrivals doors at the Greenough Terminal. There are six (6) ACROD parking bays in the short term car park directly opposite the Greenough Terminal, and six (6) ACROD parking pays in the long term car park opposite Pay Station #2. All parking is free for the first hour. Passengers are encouraged to liaise with the airline at the time of booking for any direct assistance requirements between kerbside and the terminal. The main entrance to the terminal is through automatic double doors. Access to check-in counters from that point is on one level and accessible with a wheelchair. There are two (2) unisex / wheelchair accessible toilets located at the northern and southern end toilets within the main terminal lounge area. There is one (1) unisex / wheelchair accessible toilet within the sterile lounge area. All unisex / wheelchair accessible toilets are equipped with baby change facilities. Toilets have Braille identification signage which has been provided in accordance with appropriate standards. Announcements relating to boarding are made over a loud speaker and hearing loops are available in the sterile lounge area. There are two Flight Information Display screens in the main arrival and departure lounges and two in the security screened lounge area. Guide and assistance animals are allowed in the terminal building. Passengers travelling with a guide or assistance animal are encouraged to provide information to the airline when making a booking to allow for appropriate seating arrangements. 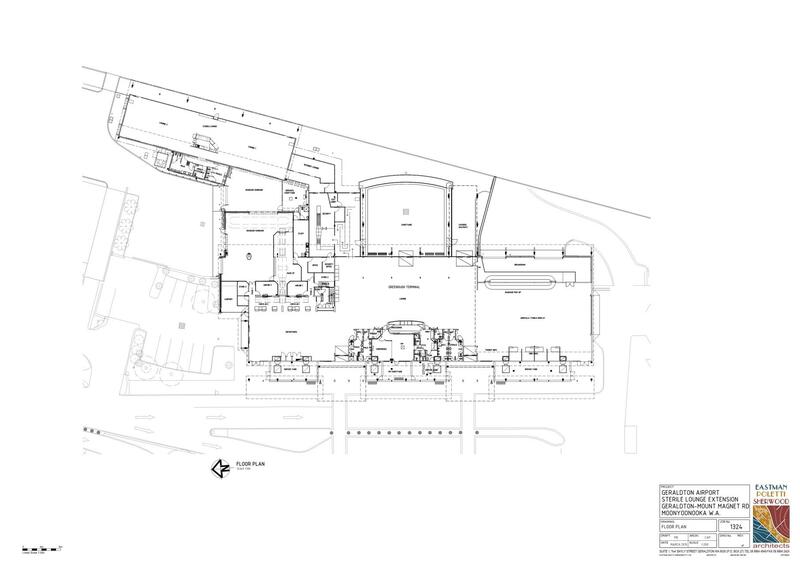 A floor plan of the terminal building showing the location of check in counters, departure gates, hire car counters and toilet facilities is attached to this plan. In the event of emergency instructions will be provided by the fire warden or an airline staff member. To ensure safety passengers are required to follow instructions. For passengers in wheelchairs, who are unable to move through the metal detection unit, access through the security screening point is provided with the provision of a hand held screening wand. It is advisable to contact the airline prior to travel to discuss any matters which may impact on the passenger’s access to security screening and the screened departure lounge. Requests for assistance are to be directed to airline staff as assistance will be arranged by the airline. Details of the airlines which service Geraldton Airport and links to their websites are available from the Links Page on the Geraldton Airport website. The plan encourages passengers with concerns to contact airport management staff or a disability advocacy group. If a heightened threat level were to be applied at Geraldton Airport, or the industry as a whole then this may impact on the delivery of the level of disability access described in the plan. The local disability advocacy groups are encouraged to provide information regarding any concerns which are disclosed to them regarding travel through management staff at Geraldton Airport. Any concerns notified to airport staff either directly or through the disability advocacy groups will be dealt with in a reasonable timeframe through consultation between the City of Greater Geraldton, the parties concerned and the airline concerned. The plan provides telephone numbers and email addresses. The provision of a detailed map may assist some passengers with a disability. There are currently no plans to upgrade the Greenough Terminal Facility at Geraldton Airport. Any future changes to facilities will be reflected in a review to this plan.